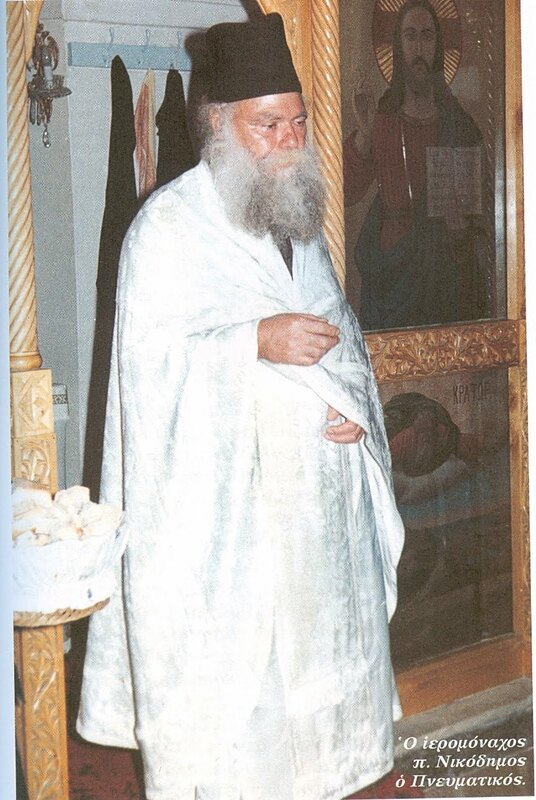 Papa Nikodemos, the spiritual father of Elder Paisios, was a man of great patience. A simple man. A hieromonk of much prayer and great virtue. He would begin prayer services after midnight and would end late in the afternoon! He read everything by himself. He would not leave out anything. Everyday he did this. He had five notebooks filled with names which they gave him over time, and he would commemorate them every day during the proskomidi. He would not throw away any of them. It took him perhaps five hours to commemorate the names, as Fr. Gerontios, who knew him very well, told me. Papa Nikodemos, before he came to the Holy Mountain, was the abbot at Koudoumas Monastery in Crete. A monk who lived in asceticism at Koudoumas, under the famous Papa Nikodemos, related to me that the shepherds of the region would go to him to give an account of the herds. He would say to them: "I don't want you to give me an account. Whatever you think is right for the monastery, leave it there before the Panagia. It is with her that you must deal." When he came to the Garden of the Panagia he lived at the Skete of Saint Panteleimon under Koutloumousiou. He served as its head. Then, for greater quietude, he came to the cell of the Panagia, in Bourazeri further up. From Eartly Angels the Hagiorites (ΕΠΙΓΕΙΟΙ ΑΓΓΕΛΟΙ ΟΙ ΑΓΙΟΡΕΙΤΑΙ) by Manolis Melinos. Translation by John Sanidopoulos.